Take the glove off, put the glove on. Take the glove off, put the glove on. There sure is a lot of messing around in golf. Take out your green tool. Take out your ball mark. Put away your green tool. I think people who play golf just love fiddling about with little stuff. 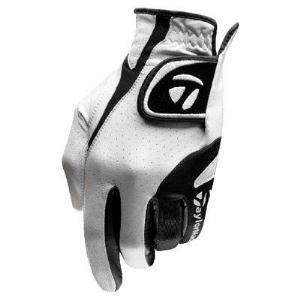 The TaylorMade Targa Tour Golf Gloves are worth fiddling with. They are a beautiful AAA cabretta leather which is very comfortable. They have a patent pending on their micro-perforated leather construction, and the wrist bands wick away moisture. The best thing about them is the antimicrobial performance fabric. This fabric fits like a… hmmm. I was going to say "fits like a glove." I guess this is redundant. I like this glove. It supplies tremendous feel and doesn't really seem like you are wearing anything at all. So go ahead and mess about. Take the glove off. Put the glove on.